There's no replacement for displacement? 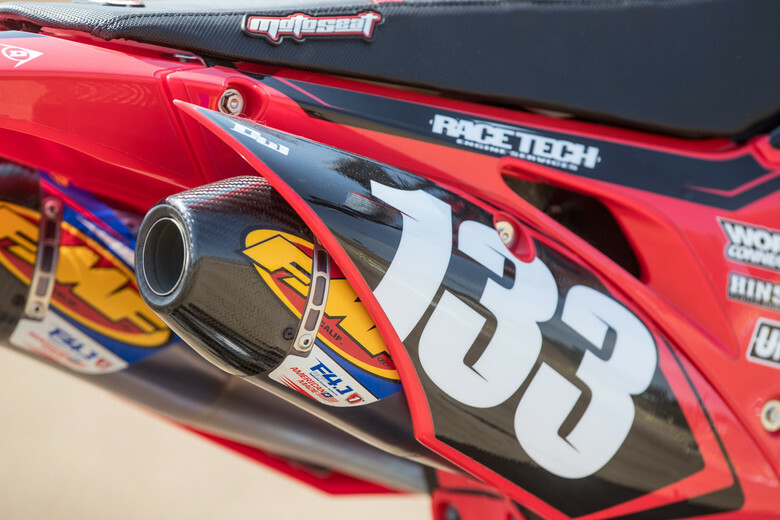 Honda's newest generation CRF250R garnished praise in our 2018 Shootout for its new chassis and overall balance, but not as much for its new engine. While the character of the powerplant was a welcome element, especially for those who chose to ride the bike aggressively, the overall output isn't stellar...especially when it comes to roll-on performance. Compared to the prior model, which was fairly vet-friendly for a 250, this bike doesn't fall nearly into the same category. But as we mentioned, the new chassis was so good...what could we do to make it a more "fun" bike to the masses? You know what they say, there's no replacement for displacement and it's about the easiest way to make more power. The powerplant mods to this bike were limited to three items: a big-bore kit, Vortex ECU, and an exhaust system. The big-bore kit measured two millimeters larger on the piston diameter, equaling 262.2cc for the total engine size. The piston was provided by Vertex and the cylinder boring/plating by Millennium Technologies. Internally, everything else inside the engine was left stock. The other hardware change was a complete exhaust system from FMF. Lastly, Race Tech mapped the Vortex ECU while they were busy with the suspension. Honestly, I'm not the biggest fan of 250 big-bores, as most tend to add great bottom end and mid-range, but sacrifice top end pull and the ride-ability of the bike at higher RPMs. As such, I'm not really the target consumer of these kits since I want to ride a 250 at higher RPMs. But even I have to admit that the CRF250R needs roll-on grunt, so I was down to give it another shot. With the CRF250R already having the largest bore in the class, I was worried how it would react to some additional size but I have to say I was pretty impressed. 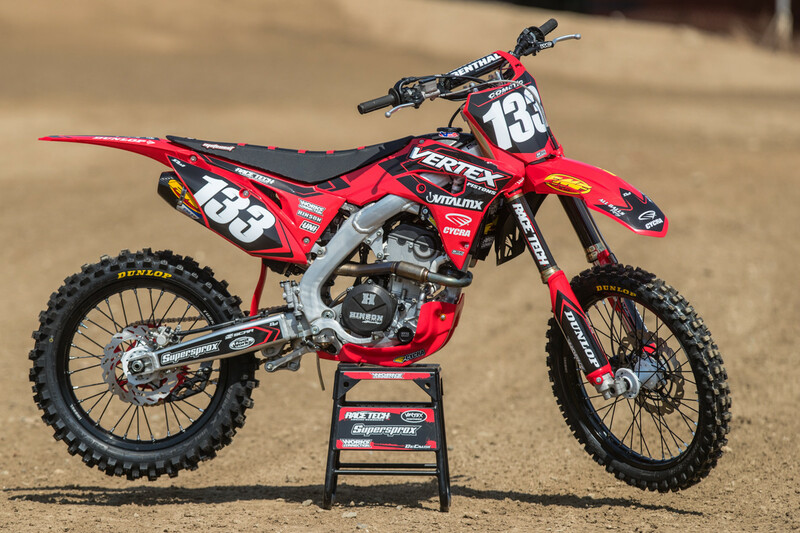 Where the stock motor struggles to roll-on in third gear while in a rut without a lot of clutch input, the big-bore version can pull itself out of the hole, much more like a YZ250F. From there, it builds into more hit and torque in the mid-range and makes the bike much more playful at lower RPMs. This is great for obstacles out of corners that previously felt like they were between gears on the stock setup. Now I could just leave the bike up a gear and rely on the engine to do more of the work...instead of a well-timed shift and pray moment. Beyond that, the assistance of a well-mapped ECU was noticeable based on the crisp and connected feel the bike gained. No matter the RPM, when you turned the throttle the bike reacted. Not in a "jumpy" manner, just in a way that felt connected, like your wrist was one with the engine. While a Vortex ECU is a good improvement by itself, the extra mapping work done by Race Tech really sealed the deal. Now how about the top end? It actually held onto its stock high RPM characteristics quite well, more so than I expected. In my opinion it took a bit longer to get through the top of the range, but it still pulled and ended in a way that satisfied me. 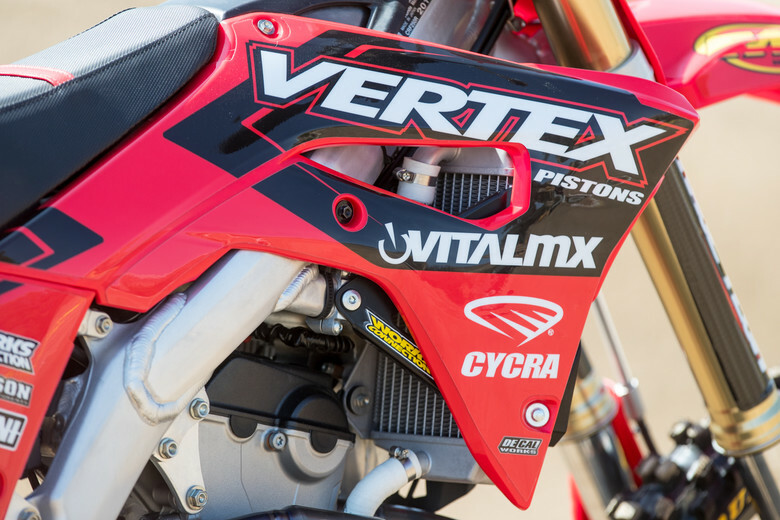 Between the bigger Vertex piston, ECU and FMF system the power was much more well-rounded than stock, while still maintaining the playful/aggressive nature of the bike. While 262cc may not seem like a big jump, it was effective and there's more on the way. Vertex has this spec piston available but it requires Millennium Technologies to bore out your stock cylinder. If you're looking for a power jump without the usual effects of a larger bore, this is a great option. But if you're a fan of that big-bore feel on a 250F...there's a complete 270cc kit coming from Vertex/Cylinder Works in December. As I mentioned above, the stock chassis is one of my favorites in the 250 class. I was glad to see that in this build nothing was done with triple clamps or linkages, as I didn't have a major desire to mess with those parts. As for mods, Race Tech took the suspension and actually set it up a bit above my weight, more for the average vet rider. So while the spring rates were a tad high for my size, the valving was softer and added a lot of comfort. The biggest positive I noticed was how composed the bike was under braking and the balance it maintained. The bike didn't feel as aggressive as stock for valving, definitely adding more comfort on low-speed situations, but at the same time it didn't wallow or feel too soft in high-speed G outs or long braking zones. Over the past seven years or so, I've personally seen an improvement in Race Tech's settings over everything I've tested and the biggest compliment I can give them is for the balance they utilize in their setups. I feel comfortable on them right away and don't feel like I'm messing with fork height or sag at all. Outside of these bigger upgrades we've talked about, there were a range of products thrown at the bike to make the ride a bit more enjoyable...or just to drool when looking at it. Scar included some titanium footpegs for increased grip and lower weight, while Works Connection gave the bike the usual treatment of bling and protection, as they have something to fit nearly everything out there. Performance-wise, this CRF250R also included a full Hinson clutch as Honda recently had a recall due to their stock baskets breaking. Hinson's full system eliminates this from happening while also adding a more precise and long-lasting clutch. Dunlop's latest tires, the MX33s, were also included. Based on our experience, the MX33 lasts longer than the MX32/3S while the rear offers a more rounded feeling profile, which transfer more easily through the lean angles in and out of ruts. Up front, we're able to run a little bit lower PSI than the prior model for more comfort while still gaining durability. As with any Honda, they just flat out look good with a full wheelset and Tusk’s brings that at a much lower cost, enough to easily afford an extra set of rotors to go along with the wheels themselves. Lastly, durability was upped with TM Designs full chain slider and guides. Sure, they make a little more noise but they're fairly indestructible compared to the stock parts. Not on this one, apologies. I like the white hubs. Subtle but different. ...Plus the white powder coating saves 16lbs and adds 7 horsepower. did the motor lock up after 5 hours? Nope. It had more than that on it before we rode it. Our 2018 test bike had about 45 hours on it before it was turned back without an issue.